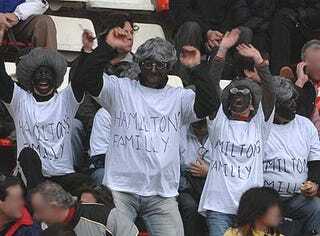 OK Spain, what's up with all the racism? How can a land that has given us Penelope Cruz, dinner at midnight and Pan's Labyrinth have such an ugly personality trait? I don't know a lot about soccer, but this has to be unprecedented: Spanish powerhouse Atletico Madrid will not be allowed to play in its own stadium for its next two Champions League games. The reasons should be obvious to anyone who follows the sport at all. UEFA, the sport’s European governing body, levied its heaviest punishment to date in banning Atletico Madrid from playing at the Vicente Calderon Stadium because of the club’s fans’ racist actions during last month’s match between Atletico and Marseille, of France’s Ligue 1. Monkey chants were aimed at Marseille’s black players, insults were directed toward black journalists inside the press box and the team bus was attacked by Madrid supporters following the match. Atletico Madrid’s coach Javier Aguirre also received a two-game ban for repeatedly swearing at Marseille midfielder Mathieu Valbuena, calling him a “son of a whore.” The Spanish club was fined 150,000 euros and will have to play games against Liverpool (Oct. 22) and PSV Eindhoven (Nov. 26) at least 300 kilometers outside of Madrid.